An instance of the block cipher. IV max size in bytes. IV min size in bytes. Base class of all cipher chaining modes, template version. Each instance uses a specific block cipher. 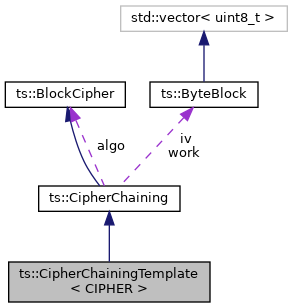 The combination of a block cipher and a chaining mode also implements the same interface as ts::BlockCipher. CIPHER A subclass of ts::BlockCipher, the underlying block cipher. [in] iv_min_blocks Minimum IV size in multiples of cipher block size (default: 1). [in] iv_max_blocks Maximum IV size in multiples of cipher block size (default: 1). [in] work_blocks Temporary work buffer size in multiples of cipher block size (default: 1). Set a new initialization vector. [in] iv Address of IV. [in] iv_length IV length in bytes. Reimplemented in ts::DVS042< CIPHER >, ts::DVS042< AES >, ts::DVS042< DES >, and ts::DVBCSA2. Get the minimum IV sizes in bytes. The minimum IV sizes in bytes. Get the maximum IV sizes in bytes. The maximum IV sizes in bytes. Get the minimum message size. Shorter data cannot be ciphered in this mode. Implemented in ts::DVBCSA2, ts::DVS042< CIPHER >, ts::DVS042< AES >, ts::DVS042< DES >, ts::CTS1< CIPHER >, ts::CBC< CIPHER >, ts::CBC< AES >, ts::CTS3< CIPHER >, ts::CTS2< CIPHER >, ts::CTS4< CIPHER >, and ts::ECB< CIPHER >. Check if the chaining mode can process residue after the last multiple of the block size. True if the chaining mode can process residue after the last multiple of the block size. Implemented in ts::DVBCSA2, ts::DVS042< CIPHER >, ts::DVS042< AES >, ts::DVS042< DES >, ts::CBC< CIPHER >, ts::CTS1< CIPHER >, ts::CBC< AES >, ts::CTS3< CIPHER >, ts::CTS2< CIPHER >, ts::CTS4< CIPHER >, and ts::ECB< CIPHER >. Implemented in ts::DVBCSA2, ts::DVS042< CIPHER >, ts::DVS042< AES >, ts::DVS042< DES >, ts::SCTE52_2008, ts::CBC< CIPHER >, ts::CTS1< CIPHER >, ts::CBC< AES >, ts::CTS3< CIPHER >, ts::CTS2< CIPHER >, ts::CTS4< CIPHER >, ts::ECB< CIPHER >, ts::DVBCISSA, ts::SCTE52_2003, ts::IDSA, ts::AES, ts::DES, and ts::TDES. Implemented in ts::DVBCSA2, ts::DVS042< CIPHER >, ts::DVS042< AES >, ts::DVS042< DES >, ts::CBC< CIPHER >, ts::CBC< AES >, ts::CTS1< CIPHER >, ts::CTS3< CIPHER >, ts::CTS2< CIPHER >, ts::CTS4< CIPHER >, ts::AES, ts::ECB< CIPHER >, ts::DES, and ts::TDES.